Todays HVAC technicians want a simple solution for diagnosing ventilation issues. Differential pressure measurements only tell part of the story. Technicians also want to measure air velocity and flow, without having to resort to expensive, difficult to use, specialist tools. 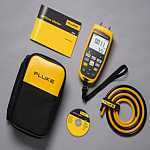 The Fluke 922 makes airflow measurements easy by combining three tools: differential pressure, airflow, and velocity into a single, rugged meter.